Ref: Fairlie Locomotives of North Wales: David Payling : Ffestiniog and Welsh Highland Railways 2017. 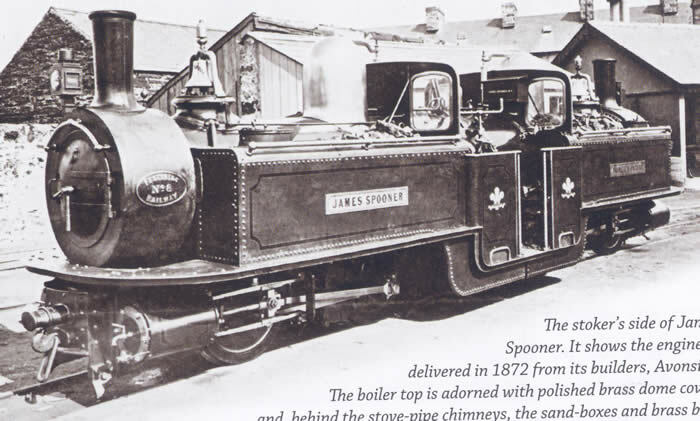 "James Spooner" has a gas tank, safety valve, water filler and gas burner for each boiler. It has one lubricator in a side tank and one regulator which is hidden behind the cab side sheet. The regulator servo, battery, gas tanks and large lubricator are in the side tanks so that the centre of the loco can be kept clear for scale details. There are two boilers joined by a single pipe from which there is one steam take off. [ See Making James Spooner's boiler in Projects ]. The boilers have main steam pipes so that each bogie has its own steam supply. The receiver and switch are housed in the "ashpan". The domes have yet to be made. The sander/bell device will cover the Goodall valves. James Spooner will be painted in Victorian maroon and then lined. A record of the build will be posted in due course. Thanks to Trev Oughton for all his help and expertise.